Corix Partners is active at a number of levels in the wider cyber security community in the UK and abroad. This is a summary of the activities which we have undertaken during Q1 2019. The Security Transformation Research Foundation released its first 2019 white paper on 17th January. Entitled “Cyber Security: Not just an Equation between Risk Appetite, Compliance and Costs“, it analyses how cyber security could be framed as an integral part of any firm Environmental, Social and Governance (ESG) strategy, and was produced by Corix Partners in collaboration with DA Resilience, Wise Partners and with the technical assistance of the CIO Water Cooler platform. On 1st March 2019, JC Gaillard, MD & Founder, Corix Partners, was appointed Non Executive Director with Strata Security Solutions. Strata deliver solutions to help customers understand the cyber security risks faced by their business. Strata, its sister company ICB Security Solutions, and their director Chris Burtenshaw, have been long-standing associates of Corix Partners. Corix Partners is delighted to announce that since 8th March 2019, some of its blog content is now available on the IoT for All platform. IoT For All is a leading technology media platform dedicated to providing the highest-quality, unbiased content, resources, and news centered on the Internet of Things and related disciplines. Click here to read our first contribution. 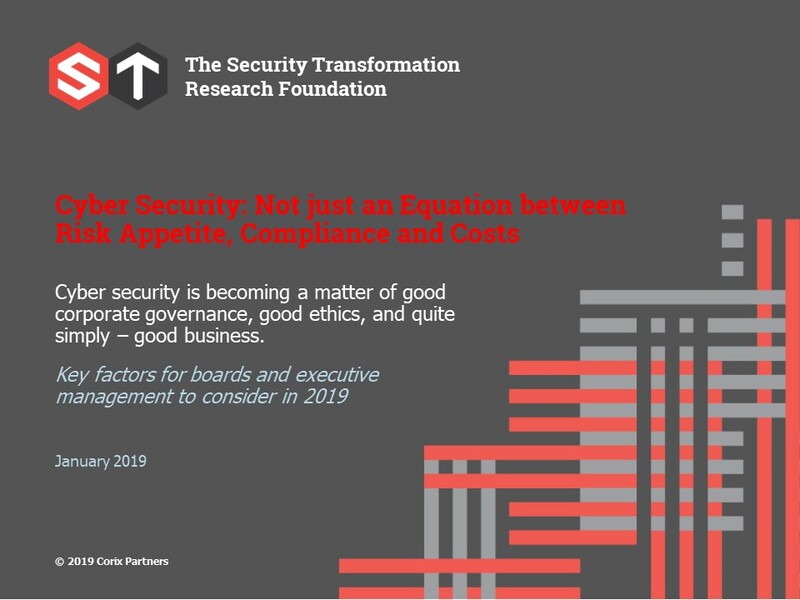 Corix Partners and the Security Transformation Research Foundation are delighted to annouce that throughout February 2019, they have restructured their posts on Medium into a Medium publication. The publication entitled “Security Transformation Leadership” embodies the foundation’s objectives of looking beyond Technology towards Security Leadership, Strategy, Governance, Culture and Resilience and delivering a challenge and an alternative view on common practices in the CyberSecurity space to help the Industry move forward.